Sharma SK. 1995. Ornithobotany of Indian Weaver Birds. Himanshu Publications: Udaipur & Delhi. Dust jacket. "ORNITHOBOTANY of Indian Weaver Birds" is an exhaustive interdisciplinary approach which throws light on various fascinating aspects of Indian Weaver Birds in plant perspectives. Like many other avian brethren. They depend upon plants for nest and rooting [roosting] site, nest material and food, as also for nest-beautification. These aspects are described in fuller detail in the book. This Book would make indispensible reading for botanists, zoologists, or-ornithologists, foresters, environmentalists, conservationists and all the nature lovers and environment friendly people. This book covers the fascinating ecological relationships of the Indian weavers and plants. Weavers use trees and other plants as nest sites and for nest material. Asian weavers often use flowers to decorate their nests, a feature not found in the nests of African weavers. 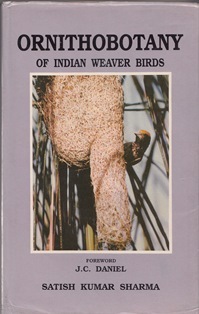 The author also discusses abnormal nests, and nesting in forests. The final chapters cover the uses of weaver nests by other birds and animals, the role of nests in agriculture, and the use of nests to local people. For instance, weaver nests in India have been used as sieves to clean liquids like sugarcane juice, nests have been used as scrubbers for cleaning hands and feet, cattle fodder, as fuel to make fires, and as decorations in homes. The book is well illustrated with line drawings and photos (mostly black and white).